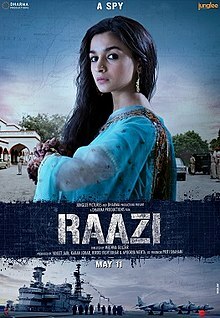 Raazi is an upcoming Indian period thriller film directed by Meghna Gulzar and produced by Vineet Jain, Karan Johar, Hiroo Yash Johar and Apoorva Mehta under the banner of Dharma Productions. It features Alia Bhatt and Vicky Kaushal in lead roles. The film is an adaptation of Harinder Sikkaâ€™s novel Calling Sehmat, about an Indian spy married to a Pakistani military officer during the Indo-Pakistani War of 1971.